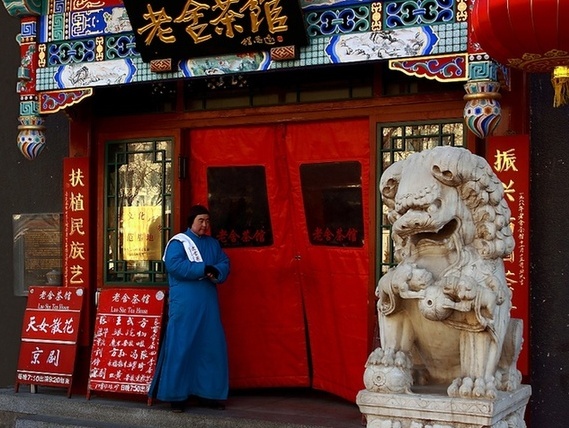 Lao She Teahouse, named after China's renowned author and Beijing native Lao She, is a fine place to experience Beijing's old customs and traditions. The teahouse is a two-story building. Once you walk in, on your left you will spot several distinctive and small clay figures of people from the Qing Dynasty chatting and enjoying their time over tea – a lively picture of what happens in this city every day. The first floor is a VIP area which accommodates six rooms spread out across the siheyuan-style ground. The second floor, named Dawancha Teahouse, is for fans of Beijing folk art. Traditional Chinese art forms such as Chinese paintings, Buddha statues, paper cuttings, clay figurines, antiques, kites and jade articles, are put on display on this floor and give you a glimpse into China's ancient culture.